This is a photo of my friend, Pemba. I heard yesterday that Pemba had died sometime during the past week. Details are still sketchy and unconfirmed, but he was in the Mustang area of Nepal at the time. I first met Pemba in 2009 while on a trek to Everest Base Camp South. He was one of our guides, working directly, I believe, for Mountain Tribes, the company that planned our trek (most of our sherpas were hired on the spot at the start of our trek). Since then Pemba had continued guiding treks and had risen to the position of "sridar," leader of the sherpa crew. Pemba and I had occasionally corresponded on Facebook, and I like to think that we had become friends. Last April Andi and I returned to Asia to go on a tour of Bhutan. On our the way back home we stayed in Kathmandu for a couple days and had the great fortune to attend the reception following Pemba's wedding. We were treated as honored guests, but I really think it was our honor to be part of this important day for Pemba and his wife. I made this photo on the way into the reception area. Pemba had come outside to greet us. We had hoped to be in time for the ceremony, but the tikka (the mark on his forehead) told us that the ceremony was over. Still it was great to see Pemba again, and the reception was a lot of fun. For me it was an amazing day that I will never forget, just as I won't forget my friend, Pemba Nuri Sherpa. On both ends of our recent visit to Bhutan, we stayed in Kathmandu, Nepal for a couple days. It seemed mostly the same after five years away... crowded streets, lots of noise (especially vehicles honking), street vendors and beggars, crumbling buildings. There were some differences, too. A lot of old buildings are being torn down and new buildings are being erected, the Rum Doodle has moved, and the New Orleans Cafe didn't seem to be as good a hangout place (check out the Revolution Cafe instead). 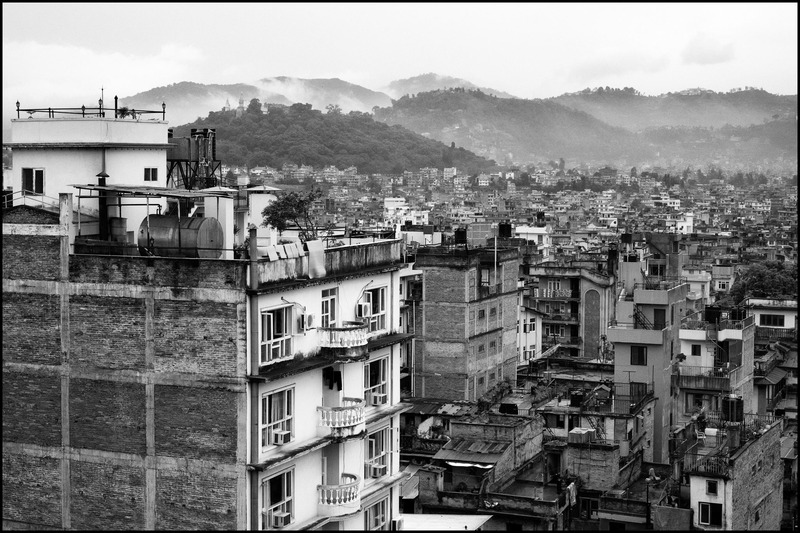 We've been through Kathmandu four times now, and that seems to me to be enough. We did enjoy visiting Swayambhunath (a.k.a. The Monkey Temple) again, especially seeing our friend Karma who works there. The temple seemed to be in very good repair compared to what it was in 2009. We also enjoyed visiting Baudhanath, and I spent most of my time there doing koras around the base of the stupa and occasionally making some photos. I was glad to not visit Pashupatinath, once was more than enough for me. If we do end up in Kathmandu again, which is likely as it seems to be the gateway to the Himalayas, we will definitely try to stay at the Hotel Yak and Yeti, a quiet oasis in the midst of chaos.